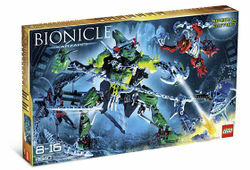 8940 Karzahni is a BIONICLE set which includes three figures, the main one being Karzahni himself, as well as two Matoran, Sarda and Idris, and a trap. This was a Special Edition set. Karzahni and his brother Artakha were among the first creations of the Great Beings, and each was given a domain to rule over. Originally, Matoran were sent to Karzahni in order to be repaired and returned to their homelands – but Karzahni never really knew how to do his job. Instead of rebuilding them to restore their efficiency, Karzahni's attempts severely shortened their stature and strength. Ashamed to let others see his work, he sent a number of "repaired" Matoran with weapons to compensate for their physical shortcomings, to Mount Valmai, far away from everyone. After several more failures, Karzahni became convinced he was not to blame, but the Matoran themselves. He thought they should be punished instead of being fixed, so he imprisoned the Matoran. When nobody ever returned from Karzahni, Matoran eventually stopped being sent to him. Over time, his and Artakha's realms passed into legend, with the myths saying that bad or lazy Matoran were sent to him not for repair, but for punishment. When Matoran enter Karzahni's domain, he has them abandon their old masks as a way of making them abandon their old identities, and he uses his Kanohi Olisi to show them terrible "what-ifs", making them lose all hope. For instance, Jaller saw the devastation which would have come to pass if Takua had never become Toa Takanuva. As a result of this, Karzahni gained possession of the Kanohi Hau Jaller wore, which had once belonged to Toa Lhikan, the hero of Metru Nui. It was only later that the Toa Nuva were able to recover it, after Karzahni had left his realm. Until recently, Karzahni did not even know of Makuta, Mata Nui, the Toa or anything else of the world outside his kingdom. His first knowledge of them came from a group of Matoran from Metru Nui. At first, he didn't believe the tales they told, but then through his own mask power he saw that the universe would cease to be if Mata Nui died. Now that he knows what exists outside his kingdom, he aims to take control before Mata Nui wakes up; molding his Matoran slaves into an army for just such a purpose. He has quietly followed the Metru Nui Matoran after they escaped his realm, watching as they became the Toa Inika. Along the way, he began assembling new military forces, including Zyglak and Manutri birds. However, he lost track of the Matoran after entering the undersea world of the Pit, distracted as its black water mutated him. He has since come across Toa Lesovikk and attacked him in order to sharpen his combat skills. Lesovikk escaped, but the hero has vowed to destroy Karzahni rather than let him threaten any Matoran again, be they those of the undersea city of Mahri Nui or the ones living in his own realm. Soon afterward, Karzahni overheard some a group - including two Toa and a robot - discussing the Staff of Artakha. Hating anything to do with his brother, he immediately attacked and defeated the Toa. However, the robot was being possessed by the evil Makuta, and the two titans began to fight. Although Makuta won at first and turned Karzahni's army of Manas against each other, Karzahni made Makuta scream in terror by giving him a vision of Mata Nui awakening and delivering his wrath. Makuta retaliated by using his telepathic powers to completely obliterate Karzahni's mind, possibly making him more of a threat. Sure enough, when Lesovikk and his Matoran companions Sarda and Idris arrived at Karzahni's hiding place at a nearby sea cave, Karzahni used his mask power to show Lesovikk a vision of a timeline that was his greatest dream: one where his fellow Toa had not died, and one that he would never want to leave. Fortunately, Karzahni's illusion was flawed, and Lesovikk was able to break free. Meanwhile, Sarda and Idris lured Karzahni into a trap, and the now-captured conqueror was taken into Order of Mata Nui custody by Botar. At some point, he migrated to Spherus Magna along with the other former inhabitance of the Matoran Universe. He was later found dead in the Iron Canyon.Toa Lesovikk's air blade was found next to his body making him a suspect towards Karzahni's murder. Before being mutated Karzahni had an ancient appearance, with ebon- and gold-colored bladed armor and a Kanohi Mask that was seemingly made of three or four older masks patched together. This mask is an Olisi Mask of Alternate Futures, able to make himself and others experience alternate or possible futures; usually bad ones. As part of his mutation in the Pit, his mask has fused to his body, but he can still use its powers. He also carries a burning chain and his gauntlets crackle with energy. Shortly after he arrived in the Pit, he found one of the Barraki squid launchers and began carrying it as his own weapon. This is a description taken from LEGO.com. Please do not modify it. (see an archive of the product's page) Evil under the sea! This special set includes Karzahni, Sarda, Idris and trap! Karzahni features a horned mask and evil red eyes! Karzahni is armed with a a squid shooter and blades on his body! Help the Matoran capture Karzahni using the trap that really closes! Karzahni stands 10.5" (27 cm) tall! Sarda and Idris are over 4" (10 cm) tall!